the one describe by Leurechon, c. 1638. We say the mercury is rising to mean it's getting hot out, despite the fact that most home thermometers have no mercury in them anymore. Regardless of the liquid they contain, the level rises with increasing temperature in the iconic liquid thermometer. But this was not always the case. 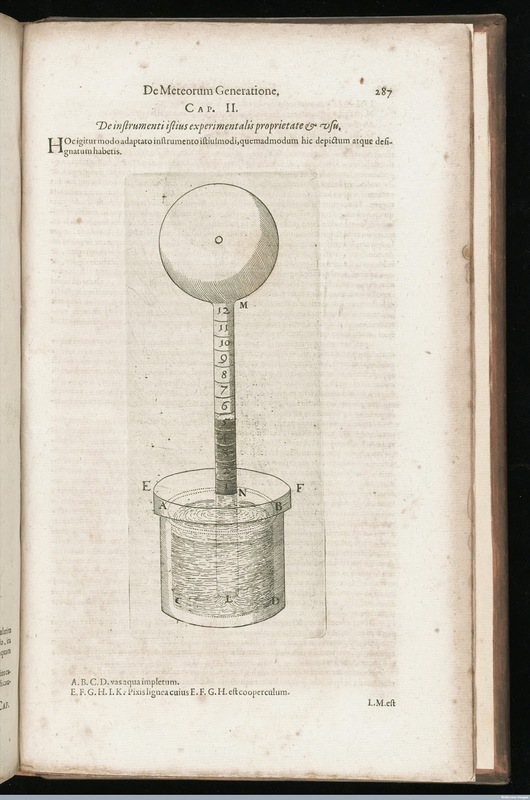 The word thermometer was first coined (in French) in a book of mathematical recreations written in 1626 by Jean Leurechon, SJ (writing as Hendrik van Etten). 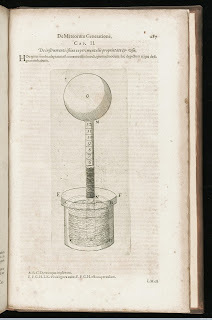 In his description he notes the thermometer you can construct from a glass tube and small container of water (or other non-viscous liquid) can be used to quantify temperature by placing marks on the glass, associating each with some fraction of the classical four (or eight) degrees of hotness. Such thermometers, he suggests, can be used to adjust the temperature of a room or a furnace, to record (and predict) the weather and to measure fevers in the ill.
A century later, Anders Celsius constructed a temperature scale based on water's phase changes which ran in the same direction. Water on Celsius' scale boiled at 0 degrees and froze at 100 degrees. This reverse run didn't last long, two years later Carl Linnaeus (of taxonomic fame) used the scale to describe conditions in a greenhouse, but flipped it to the form in which we know it today, where 100 is the boiling point of water. It is tempting to think that Celsius' scale ran in the direction it did because it mimicked the earliest marked thermometers. But Fahrenheit's scale, which preceded Celsius' by two decades, runs in the modern direction, things get hotter in the positive direction. This also parallels the classic notions of degrees of heat in play during the medieval period. There were four (or eight or six, depending on the source) degrees of heat, the first being more or less physiological temperature, the fourth being a blazing hot furnace. The word degree has its roots in the Latin degradum, a down step. This matches Leurechon and Celsius' use - 9 degrees is eight steps lower (colder) than 1 degree. Thermometer came from France, in a book of mathematical reactions?